The 942 is the exterior half of Safariland's popular buckleless hook-and-loop belt system. A hidden brass hook and a fully lined hook closure fasten the belt firmly around your waist. 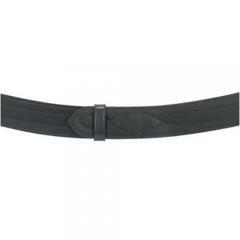 The belt is lined with a band of hook, which attaches to the loop lining on our Model 99 Garrison belt, which completes this truly buckleless system. Use our Model 183 hook-and-loop Self-Stick Kit on your accessories to enhance rig adhesion. 2 1/4" wide. Available in Plain, Hi-Gloss, Basketweave and Nylon Look finishes.